Battle scenes just won't be the same on TV. But the film should still work, depsite its other problems. Watch with the lights out for maxiumum transportation into the story. Perhaps the title "Dances with Samurai" was already taken when "Gladiator" screenwriter John Logan began work on this grandiose Oscar-baiting epic about a drunk, disillusioned Civil War veteran who is sent to Japan to help Westernize its military, but instead comes to embrace the honor and discipline of the ill-fated warrior class he's meant to defeat. "The Last Samurai" does bear an undeniable structural and emotional resemblance to Kevin Costner's 1990 American frontier drama, also about a 19th-century soldier who casts off his imperialist ways to be absorbed into a native culture. But in this film the white man is played by Uber Movie Star Tom Cruise with a melodramatic steamer-trunk's worth of emotional baggage -- two factors that tend to draw focus away from the fact that a culture is being obliterated and toward the interloper's personal journey through self-loathing to redemption and heroism. With his feathered, over-conditioned hair and blinding white teeth, Cruise is inescapably incongruous with 1870s Japan, but he does turn in an otherwise strong performance as army captain Nathan Algren, a man haunted by memories and beset by the remorse for his part in the Indian Campaigns that wiped out thousands of Native Americans in the name of Manifest Destiny. Recruited to train the Japanese imperial army in modern weaponry and battle tactics by ruthless, coercive advisers to a milksop teenage emperor, he's resigned to the notion that killing is all he's good for, but still writes woefully in his diary (kept in a medicine bag that is meant as a reminder of his well-earned white guilt) that "I have been hired to help suppress the rebellion of another tribal leader." But once he arrives in a rapidly modernizing Tokyo (hundreds of telegraph lines are strung all over CGI-rendered panorama shots), he finds his authority undercut by the one-dimensional, cowardly and unprincipled former commander (Tony Goldwyn) who recommended him for the job. Forced to lead unprepared troops who can barely aim a gun into a skirmish against an army of samurai trying to defend their traditional ways (they don't use guns at all), Algren courageously takes the lead himself (although he also clearly has a death wish) and is captured as his men are overrun. Well-respected Japanese actor Ken Watanabe is the film's most powerful presence as the title character, a learned warrior and leader named Katsumoto who realizes, when Algren doesn't commit seppuku for shame of having lost the battle ("It's not their way," Katsumoto tells a resentful lieutenant), that he can learn about his enemy by guarding this stranger closely but welcoming him into the society of his samurai village. But as Algren is given shelter with the family of a warrior he killed in battle (enter the Pretty Widow Love Interest), and as he begins to feel a growing respect and curiosity toward his captors, the film's personal and cultural themes find temporary synchronicity -- that is until the American hero has his Zen moment while being trained as a samurai fighter. After that, director Edward Zwick ("The Siege") tends to get carried away with the slow-motion hero shots of Cruise swinging a Katana blade with passionate, meditative vehemence (while gritting those pearly whites as sweat flies from that pretty mane of hair) in otherwise potent scenes, including an attack on the village that brings Algren and Katsumoto together as allies. All this leads up to inevitable combat with Katsumoto and Algren leading the samurai with their honor, armor and swords, against the emperor's army with its US-supplied Howitzers and Gatling guns. 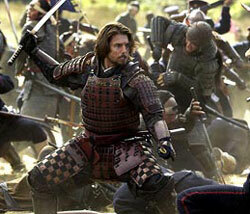 Are the samurai ultimately doomed against firearms, charging progress and 2,000 men? Well, duh. But they won't go down without a bloody, extremely cinematic, strategically imaginative fight. When he's not fiddling with camera speeds, Zwick has an elegant command over "The Last Samurai," handling even the thankfully minimal romance with relative dignity and amassing monumental, riveting combat sequences. But then just as it seems the movie may end gracefully and with its spotlight quite properly on the dying breath of 600 years of samurai tradition, along comes a histrionically tear-filled epilogue that makes this picture seem even more about the guy who wasn't a samurai at all but just fought like one. Because it is a handsome, sweeping, huge-budget period picture with "Gladiator" style and pedigree, don't be surprised to see "The Last Samurai" over-rated and nominated for several Academy Awards. After all, that's what it was designed to do. But don't be fooled either. While the movie has many strengths -- the staggering battles, Watanabe's performance, captivating cinematography -- it's an epic for epic's sake and not a film of much true substance.